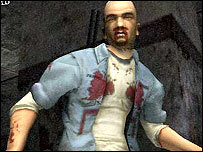 Manhunt was withdrawn by High Street chains after a murder case. The prime minister has told parliament a violent video game - blamed by some for the death of a Leicester boy - should not be used by children. Leicester East MP Keith Vaz asked Tony Blair to investigate links between Manhunt-type games and violence. Mr Blair said, on Wednesday, the game was "wholly unsuitable for children". Police investigating the murder of Stefan Pakeerah, 14, dismissed its influence. Manhunt was not part of its legal case. But the family of Stefan Pakeerah called for the game to be banned and blamed it for inspiring his killer to attack the boy with a claw hammer. Was the death of Stefan Pakeerah influenced by the violent game? Mr Blair said responsible adults had the right to choose what they watched, but children needed to be protected. He agreed to discuss with Home Secretary David Blunkett what action could be taken to combat the problem. Warren Leblanc, 18, of Braunstone Frith, Leics, was jailed for life for the vicious and prolonged attack with a knife and in Stokes Wood Park, Leicester. 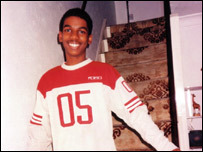 Stefan's parents said Manhunt acted as an "instruction manual" for the murder in February 2003. But while a copy of the game was uncovered during the investigation, detectives have confirmed it was found in Stefan's bedroom. The game has a British Board for Film Classification rating of 18+, which means it is not suitable for children. Dixons, Currys, PC World, Game and Virgin Megastores stores removed it from their shelves after the murder court hearing. Mr Vaz told the House of Commons in Prime Minister's Question Time: "The parents of the victim believe that the perpetrator of this savage attack was influenced by the video game Manhunt. "Later today there will be a meeting at Westminster to discuss the link between video games and their effect on children." He urged Mr Blair to commission new research into a possible connection between video games and violence and to meet with a delegation of concerned parents.